Big Dance Theater won an OBIE (the American dance scene “Oscar”) in 2000, for its “passionate practice of the most implausible choreographic and literary concoctions”. 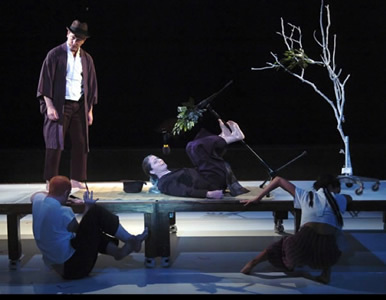 Founded in 1991 by Paul Lazar and Annie-B Parson, the New York-based group describes themselves as a “boldly arranged marriage of dance and theater.” Their latest work, The Other Here, a collision of Okinawan pop music, life insurance sales, folklore and dance is certainly an interesting minestrone. Imagine a group of performers fed-up with the limitations of pure dance, limited also by age (Lazar looks to be in his middle 50’s), deciding to venture into “theatre”. That may not be the way it happened, but judging from the piece the group brought to San Francisco, the art they offer is a kind of forced concept, a splash painting of ideas, a nearly random assortment of themes forced into an unlikely but interesting marriage. Rather than your typical East Village/Brooklyn angst and existentialism, however, the directors take a more hopeful slant—the work mercifully blends generous amounts of humor and heart. “The Other Here, one of 15 full-length works Lazar and Parson have done, is also the collaboration of all kinds of actors, dancers, composers and designers. The result, while satisfying on many levels, does require suspension of disbelief, in terms of narrative logic. As a “dance”, the piece is like album cover art, or a literary cookbook— genre-defying but sweet—not quite good enough to be ground-breaking theatre, but venturing out of the dance box enough to offer fresh news. in two distinct time periods at the same time, and a faithful male servant played by a woman (Molly Hickok). The role of movement here is reminiscent of Rowan & Martin’s Laugh In, where a weekly dance party was constantly being interrupted by bad jokes—strictly filler. However, if the result may be horrifying to a dance critic (perhaps they should think about the marketing value of the name, “Big Dance Theater”) it works well within the context of the performance created. No one is setting the world on fire, here, but Big Dance Theater does offer a uniquely layered representation of storytelling with movement and singing. Over the years, Parson and Lazar have gone all over the place, thematically (City of Brides, Hula Girl, Don Juan Comes Back from the War, Antigone). It will be interesting to see what they come up with next.